I am indebted to Henry I. Kurtz and Burtt Ehrlich, authors of ‘The Art of The Toy Soldier', published by New Cavendish Books in 1987, for some of the historical background on Heyde. As an aside, books like ‘The Art of The Toy Soldier' and the earlier ‘Art of the Tin Toy' by David Pressland, or ‘The Golden Age of Toys' by Jacques Remise define the essence of toy appreciation and value. I don't anticipate ever seeing ‘The Art of The Bean Toy' but that favourite hobby horse can wait for another article. 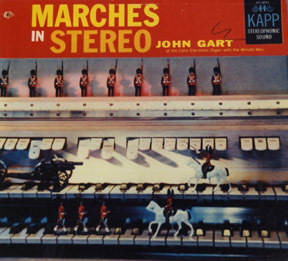 After paraphrasing messrs. Kurtz and Ehrlich for a time, I'll now quote them: "Heyde was especially noted for its military bands… Unquestionably the masterpiece… was its " Music Box " bandstand…"
As usual in collecting, you piece together the history after acquiring the item. I was mostly a Britains collector and while the occasional non-Britains piece would pass by, I didn't have the same interest. And then I came across one of these bands, one that had survived reasonably intact and boxed. 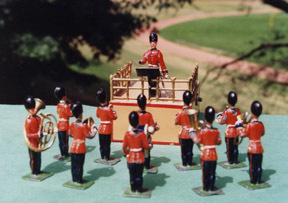 A very British Guards band. Scots I would assume, since the bearskins don't appear to have a plume. Let's see if I can get this right. 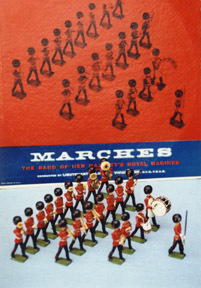 Irish blue plumes, Welsh white and green, Grenadiers white, Coldstreams red (on the right side as opposed to the Canadian Governor Generals Foot Guards red on left). Actually the bearskins are more Fusilier like but now we're getting mired. 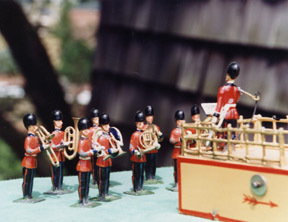 The Germans made this 52mm band with ten musicians, their music stands and a band master standing on a podium which concealed a music box. There was a series of these bands in different sizes ( also made in 68mm and 75mm ), and for different nations with the music boxes playing the appropriate national anthem. No way to tell how many different countries were available without an original catalogue. Although even the catalogue didn't list everything since variations were so easy to make. A different paint scheme and a different music cylinder and presto. Useful, since some countries tended to have short histories. When you wind the music box, and release the switch on the side of the podium, you hear the melody of God Save The King. That would have been George V at the time this band was produced; somewhere between 1910 and 1920. You can see the wire movement attached to the band master's arm so that he appears to conduct. Not as enthusiastically as a Richard Bradshaw but not completely leaden either. The movement is somewhat awkward as the linkage and leverage from a music box drum to the conductor's arm is tenuous to say the least. This one has been repaired at least twice and needs to be looked at again. But it survived, with 9 out of 10 instruments (keen observers will note one musician miming his part), all the music stands, and the music box assembly still playing, and the plain red box that the band was originally sold in. 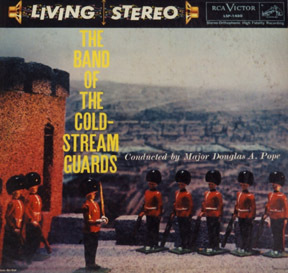 It survived in the north of England, in Jedburgh, site of a famous abbey, and not far from the town of Coldstream which is what the band really should be, Coldstreams, since it was owned by a retired Lieutenant-Colonel of Coldstream Guards. Valerie and I were introduced to Colonel and Mrs. Agnew through the usual labyrinth of contacts. including my mother, her friend Lady Anne Swan and her daughter-in-law Gina (Agnew). At dinner one night Valerie just happened to mention to Gina that we looked for old toys, especially whenever we managed to make it back to the UK. To visit my mother of course, although it is a given that there be at least 1 major toy show on during the visit. The odds are pretty good actually because, on any given day in the UK, there have to be at least 82 toy shows being held in every conceivable venue. That dinner conversation led to the house in Jedburgh that had been in the Agnew family for at least the lifetime of Colonel Agnew. A few of the family toys had remained despite the ravages of time and successive generations. Colonel Agnew produced a Gamages pond sailboat that I'm working on re-masting (broken short) and re-rigging (hand painted skull and crossbones not original!). Some of the toys that had been used in a nursery school run by Mrs. Agnew were still there and recognizable, including most of a ‘Skybirds' aeroport that I haven't figured out how to carry home. But, as always, a lot had simply disappeared or been broken over the years. Somehow, they had kept a few 1930s Whisstock boxes for sets of Britains Soldiers, including set #156, the scarce Royal Irish Regiment, set #74, the Royal Welsh Fusiliers and set # 258, British Infantry, the last inscribed P.W. Agnew, but all empty of Britains soldiers. The story was that the figures had ‘disappeared' while the house was bivouacking (not sure if it can be a verb but so much more martial than boarding) British soldiers during the second world war. Another "should have kept the boxes" story. I was very pleased to acquire the Britains boxes and am still looking for any of the Royal Irish Regiment. (Why does that remind me of one of the battle scenes in Braveheart?). Left behind by the Brits , or missed, or perhaps left intentionally because it was German made? was the Heyde band. I was even more pleased to acquire the band. I like it. And I like the history behind it and the links to real events and people that that history represents. And I like its provenance. They aren't making them like that any more.